The One-Way Pendulum was a joint FGS/FGGS production (along with The Little Sweep) and was reported in the July 1973 issue of the Farnhamian. One-Way Pendulum is a comedy play by N F Simpson. A film version of the play was released in 1964. 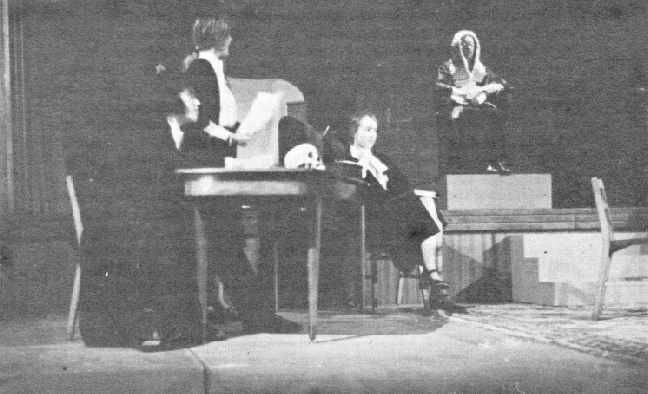 The Farnhamian only published a photograph of the production, which we reproduce below. Currently we have no further details. Photograph of the FGS/FGGS production of One-Way Pendulum. Jeremy Bradshaw may be the character shown on the extreme left. If you can identify anyone in the photograph then please let us know.